For a few days in summer under the right conditions namely mid to high tide the sun slides into the sea and reflects off a vertically cleaved slab of rock in the shape of a pirate ship. get the angle right and you will find the wetted surface of the rock courtesy of the returning tide becomes mirror like and when the angle of incidence matches the angle of reflection the slab of rock turns to burnished gold. Much like the firefall in Yosemite, takes just the right time of year. 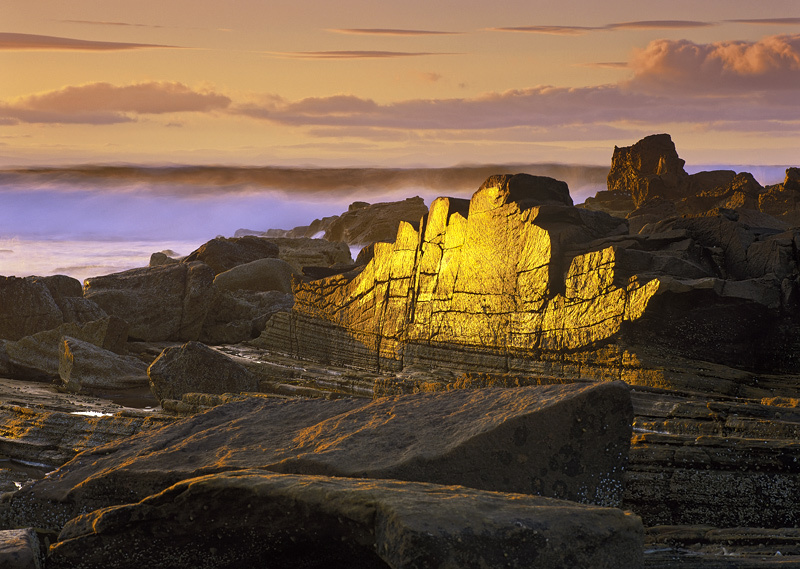 Like the added line of crashing waves in your excellent comp and capture of this golden rock face. Superb. What a fine, original composition with such a great light catch. Pure gold I would say. Gorgeous.